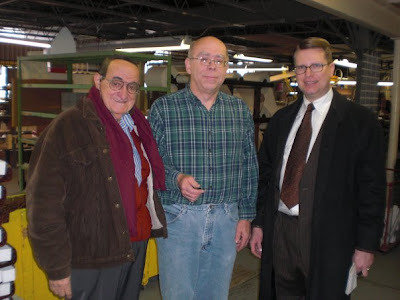 Howard is soaring like an eagle and writing a blog and he wrote the other day that we paid a visit to QRS, the venerable Buffalo piano roll company. QRS is the only place in the world that still makes piano rolls. But it is supposedly ending piano roll production and moving to Seneca, Pa. The whole situation is like something out of a movie only in a movie, QRS would be persuaded to stay. The movie would have a happy ending! No happy ending here, it looks like. I got that idea a month or so ago when I went to QRS to talk to someone there about Leonard Pennario and the folks there dropped this bomb on me, that the company would be moving. I was so crushed I had trouble concentrating on the interview I was doing. And when I cannot concentrate on Leonard Pennario, something is wrong, brother. There are no QRS piano rolls of Pennario, alas and alack. They could not get it to fit with his schedule. It is no wonder that the company is facing the sad state of affairs that it is. However. It is good to keep a sense of humor when confronting matters like this. So when we went to QRS the other day we took along lounge legend Jackie Jocko. When life gives you a twist of lemon it is always good to have Jocko by your side. "Lemon Twist" is a song I always try to get Jocko to sing. Sure enough, it worked. Before our QRS tour even started I was laughing helplessly, completely unmindful of the tragedy of the place closing, moving or whatever it is doing. That is a picture I took up above of (left to right), Jocko, our tour guide Mike Walter, and Howard. Mike Walter, who used to be production manager at QRS, went into great detail and early on in the tour he was showing us some contraption or other that would record the notes the pianist was playing. Jocko had a question. "Is there someone watching what the guy is playing?" he asked. "Because, you know, he could be playing anything," Jocko said. Later in the tour Jocko asked how much the piano rolls were. The one he was pointing to was a fancy piano roll and Mike said it was $14.99. "That's expensive!" Jocko frowned. "I'll give you five bucks." At one point Jocko went and sat down and I went and sat with him. I have a limited tolerance for mechanical stuff and I have to say that after 20 minutes I had heard pretty much I wanted to know. OK, I thought, we know how it works now. Now can't we just listen to Pete Johnson? Jocko must have felt the same way. Because at the end of the tour, which lasted about an hour, the guide asked, "Does anyone have any questions?" "No!" Jocko exclaimed. He shook his head and walked away. "You've told us enough!" I cannot stop laughing about that. What stretch of a warped imagination would couple the failure of QRS to record Leonard Pennario to the demise of the company more that 30 years later? Do you EVER think before you write? Oh, C.C., I was just kidding. Relax!